“There’s been a few road teams that have pulled off a couple victories and heading home with two in the bank,” Kadri said after the morning skate. “We’re looking to accomplish that. The Blue Jackets stunned the Presidents’ Trophy-winning Tampa Bay Lightning with consecutive road wins while the Blues did the same against the Jets in Winnipeg. “I don’t get surprised at playoff time,” Toronto head coach Mike Babcock said. “As the league gets tighter and tighter, the separation is almost nothing. 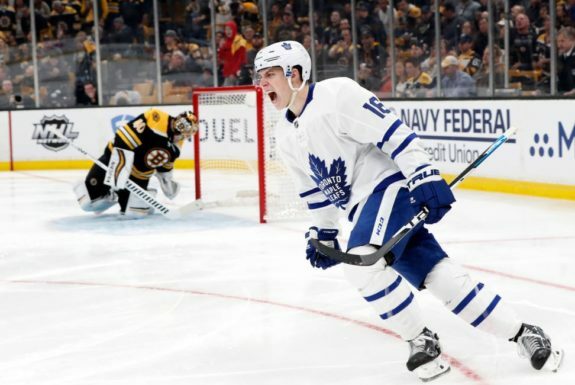 To avoid an 0-2 hole heading to Scotiabank Arena for Monday’s Game 3, the Bruins will try to key on neutralizing Leafs winger Mitch Marner. He scored twice in Game 1 and was a threat seemingly every time he touched the puck. “I’m not sure there is an answer,” Kadri said regarding how to stop Marner. “Mitchy’s Mitchy. He’s just going to do his thing. He’s just so elusive with the puck. If you try to hit him, it seems like he can slide checks, create plays. 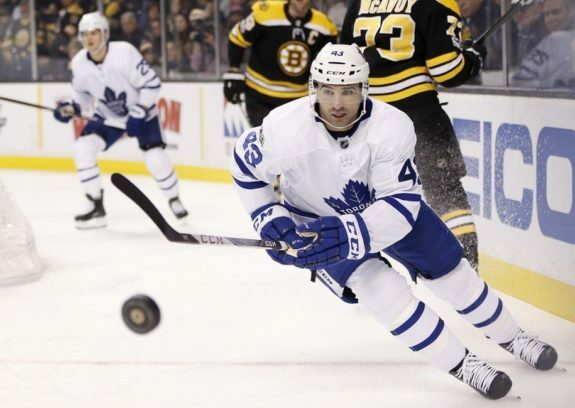 Marner _ who along with John Tavares, Zach Hyman, Jake Muzzin and Nikita Zaitsev did a solid job of containing Boston’s top line of Brad Marchand, Patrice Bergeron and David Pastrnak in Game 1 _ said it’s important the Leafs stay patient in their approach. “We just want to play the same game,” he said. “If the play is there, make it. Speaking of ice, Marner was also asked about a video from the NHL’s “Stanley Cup Confidential” series posted to Twitter that showed him mixing ice cream and chocolate sauce into a soupy mess as part of his pre-game preparations. “As a kid I just always stirred it up like that and always thought it tastes better,” said the 21-year-old. “It’s something I just continued to do my whole life.